I’m now sitting at Eluanbi, at the original Spring Scream, writing an entry on my phone that I’ll be posting later when I get wifi. It’s already Sunday. I arrived here in Taiwan on Wednesday afternoon in Kaohsiung, and got to Kenting before sunset. 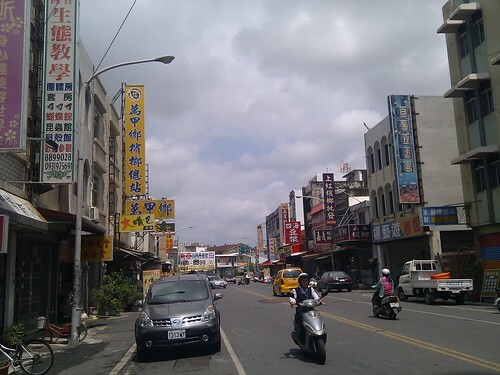 On Thursday, I spent my day visiting the town of Hengchun, the populated area next to the Kenting National Park. It’s an old town with city walls as tourist attraction. When Kenting changes into a party town, Hengchun remains a good alternative for affordable lodging and local/cheap eating. South 300m from the old city wall’s west gate, you can find a delicious viet place opened by a local man and his Vietnamese wife. 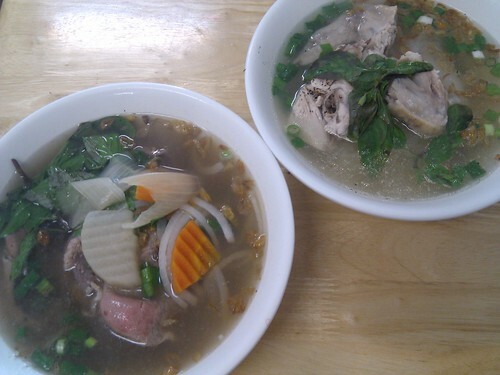 The noodles broth is bone broth and absolutely without MSG. The spring rolls were very fresh, with minced taro in them. On Friday, my friend Doug joined me and we went on the first bike trip to the Eluanbi lighthouse. Instead of a music festival, we found an empty field where the main stage of Spring Scream 春呐 used to be, and groups of tourists (including from the Mainland) who were obviously not there to listen to rock music. After visiting the Eluanbi (goose neck) park, something else I did not do two years back, we discovered that the festival had been downsized. 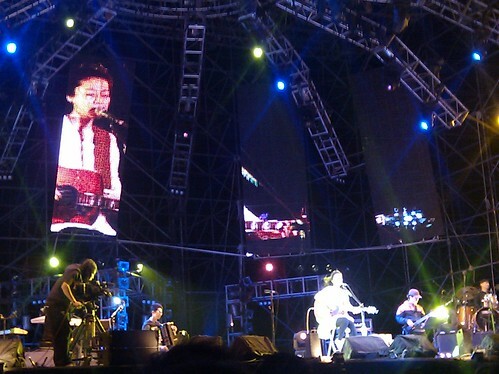 Already it did not provide printed fliers, and posters in Kenting proper were rare, but the Main stage for big-name acts like Faith Yang 楊乃文 in 2008 is no longer there. 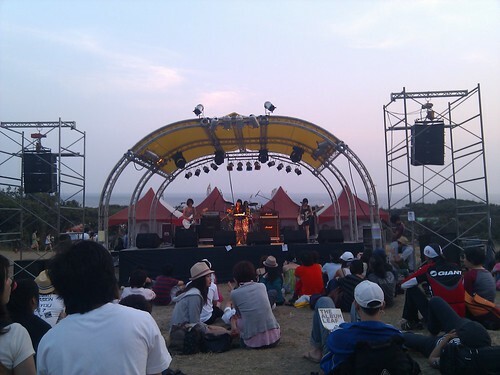 Instead, only the back of the Eluanbi park is used for Spring Scream, still with the six small stages and one DJ table. And plus, even if advertised as a four-day event, there was reportedly (from people we met randomly yesterday) only performances on Friday evening. According to the schedule, Monday is just one stage. On Saturday, because of an all-fest pass, we came to Eluanbi, but only for less than two short hours. The adventure yesterday was to be Spring Wave 春浪, a commercial, big-name festival at the Maobitou (cat head). There is no comparison with Spring Scream. While SS is a fringe event, that returns this year to its roots of promoting small bands, Spring Wave is made and conceived by the people who brought you Mandopop. One is youth-oriented, attracts expats, and the other is family-oriented, is almost exclusively Chinese (from HK and Mainland too). Even the sort of food stalls is telling: SS has hamburger, pulled pork stands manned by non-Taiwanese, along local ones, while SV offers a complement of typical Taiwan street food like fried okonomiyaki-style pancakes, five-spice fried chicken and sugar cane juice. The bike ride itself is an adventure of 14 km up and down hill from Kenting (and the same distance back), through the sleepy village of Daguang, unlit roads near the seaside, and behind the Hengchun nuclear power plant. 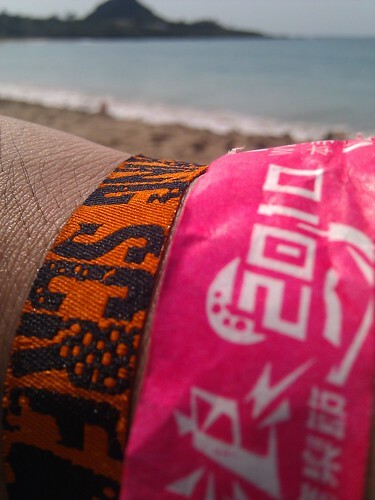 Saturday night, upon our return in Kenting town at 2:30am, we headed to the Caesar’s Hotel beach party. Maybe 500-1000 people crowding a beach, under techno music, probably drugs, raging fireworks exploding like next to you, a 3/4 moon illuminating the crowd and lots of sand in your shoes. 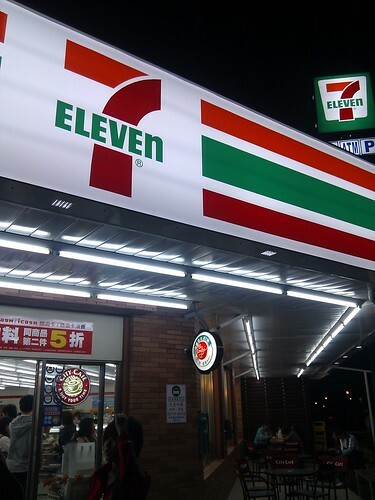 I didn’t participate, but walked across, enjoying the walk and my carton of good Taiwan milk, drunk from the bike ride. Slept about 3 hours in a tent on the beach and back up for more adventures, which today take me back (thank God) to the Eluanbi Spring Scream.